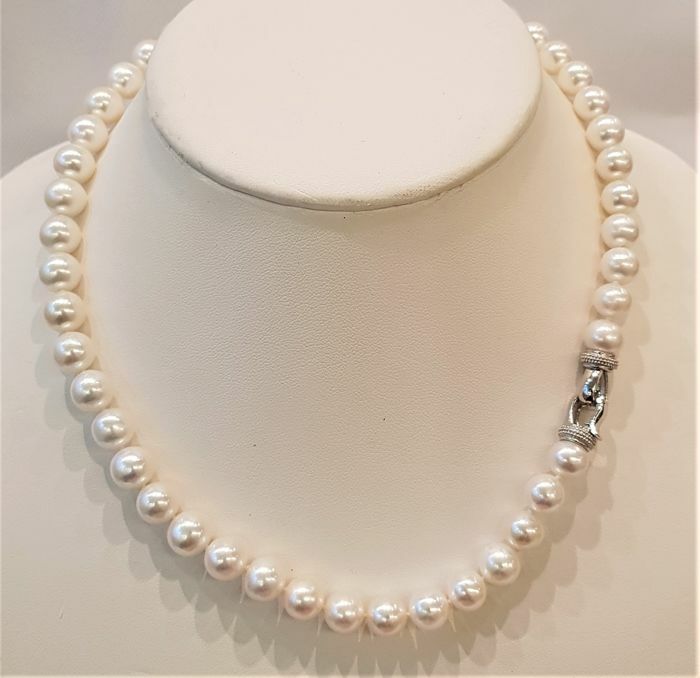 The necklace counts 47 round pearls measuring 9x10mm with high luster and is completed with a nice 925 silver clasp. At 45cm, the necklace has a standard length that complements both a high and low neckline. 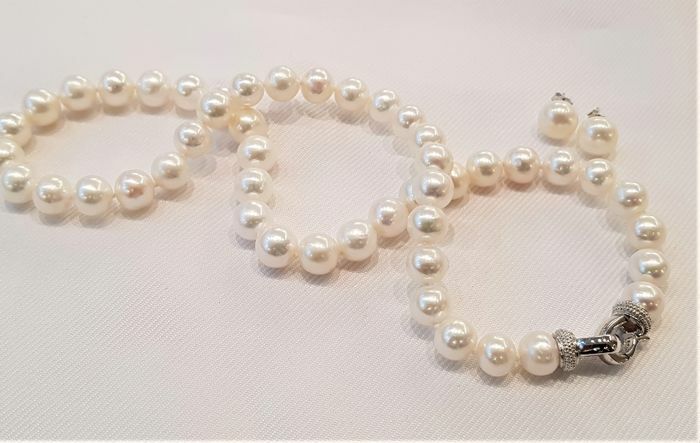 The pearlstuds are matching in size and color and have 925 silver backfindings. 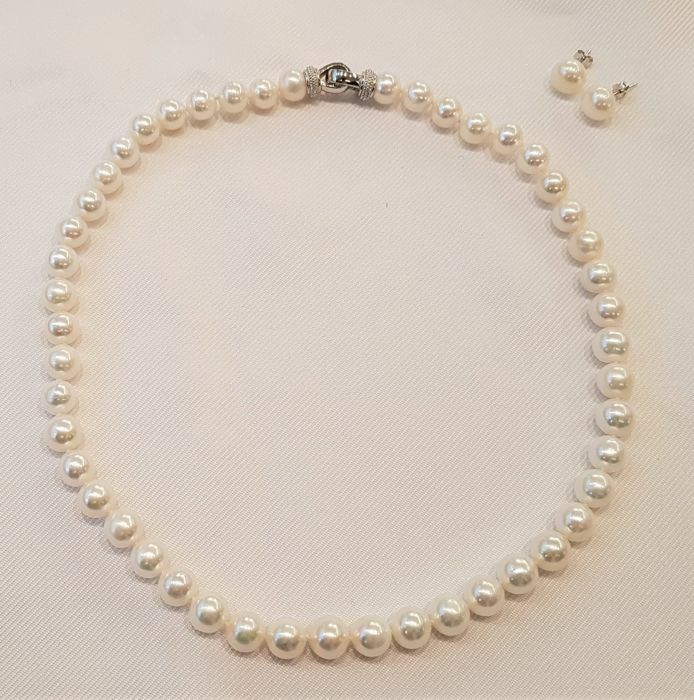 Individually knotted between each pearl for safety, the necklace is completed with a 925 silver clasp. The clasp is safe and is easy to open/close. 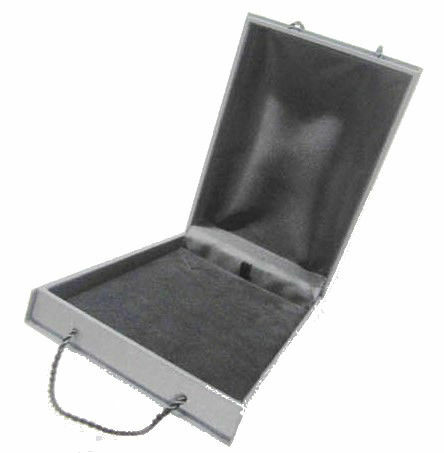 Packaging: Jewellery box and an Authenticity Certificate to guarantee the source and quality. Insured track and trace delivery. très jolies boucles d'oreille, comme la photo, merci beaucoup. Very happy with the pearls. Thank you! 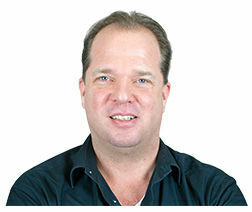 Zeer tevreden over de levering en de service!!!! Zwei sehr schöne Südseeperlen mit fast gleichem Lüster. Comanda a sosit repede , coletul a ajuns în condiții excelente , bijuteria este foarte frumoasă și de o calitate peste așteptări , am primit certificat de autenticitate.Sunt mulțumită . quick delivery. 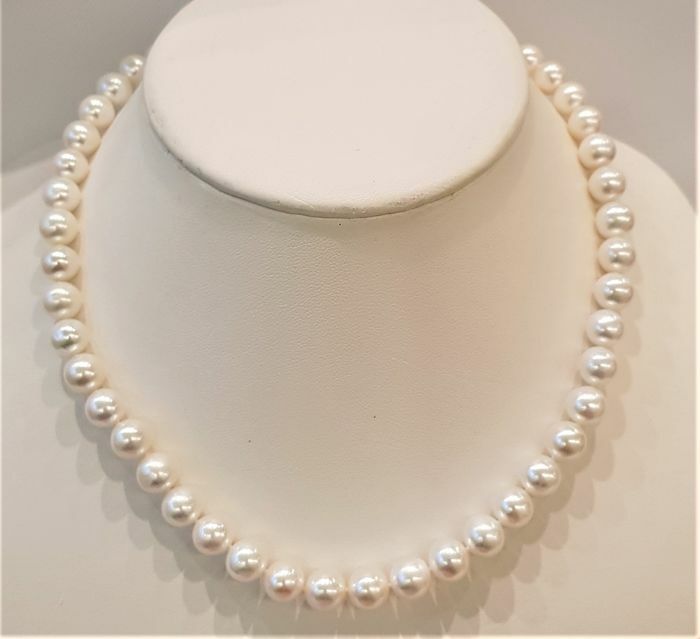 Chain is very light, pearls are nice colour. Een bijzonder mooie en kwalitatief goede parelketting! The pearl necklace looks amazing and the delivery was extremely fast!! Thank you! WOULD recommend. Excellent service, delivered promptly and safely. Very happy with goods, as described and quite lovely. Thank you. All to my fullest satisfaction. Top service and very friendly contact! 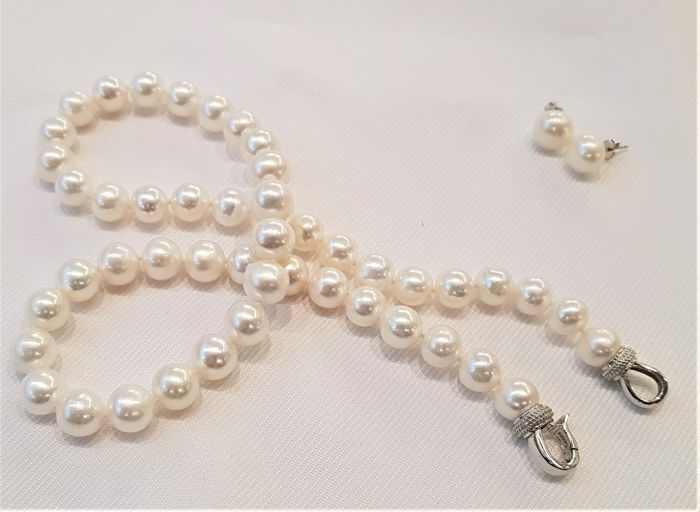 I received a very beautiful pearl necklace. Thank you! Veramente soddisfatta. Spero di fare altri acquisti on futuro con questo venditore. Gli orecchini sono bellissimi e la spedizione veloce. Puntuali , precisi , professionali. perle meravigliose di ottima qualità.spedizione veloce.imballaggio molto professionale e presente anche certificato! !venditore molto gentile e professionale!!! sicuramente ne acquisterò ancora!GRAZIE! Goede aankoop, professionele verpakking en goede uitleg mbt het geleverde, met dank voor de medewerking. Chegou dentro do prazo anuniado. Produto corresponde ao anunciado.